Physical Characteristics: Up to 45 inches long and weigh 45 lbs. ; average for Clearwater Basin is 13 lbs. ewer larger fish because of harvesting activities in the Columbia River Basin and the loss of habitat. The fish tend to be dark-olive in color, with a speckled body, silver-white shading on the underbelly and a pinkish-red stripe running along its sides. The longer they reside in freshwater, the darker they become. Diet: Young trout (juvenile steelhead) primarily feed on aquatic and terrestrial insects, crustaceans, fish eggs, and other small fish in their natal streams. In the ocean, they feed on zooplankton, marine invertebrates, and forage fish like herring. During their spawning migration to their natal streams, they seldom actively feed. Habitat: Steelhead are a resilient fish that benefits from clean, fresh water and sediment-free gravel beds for spawning and survival. Low-velocity, deep pools can provide crucial summer and winter rearing habitats. The species can withstand a wide-range of water temperatures while spending their life in both fresh and salt water systems. Range: Steelhead are found throughout the U.S. Pacific Coast, including the western Pacific and the Kamchatka Peninsula of Russia. Prior to all the dams (including Dworshak), approximately 45,000-wild steelhead returned on an annual basis to the freshwater tributaries of the Clearwater Basin. Today less than 10,000 return. In some years, the return has been as low as 3,000 fish. Fish Creek on the Clearwater National Forest is one of the most important tributary streams in all of Idaho for wild steelhead. Reproduction: Juveniles can stay up to seven years in freshwater streams before migrating to the ocean where they can stay an additional 1-3 years before returning to spawn. 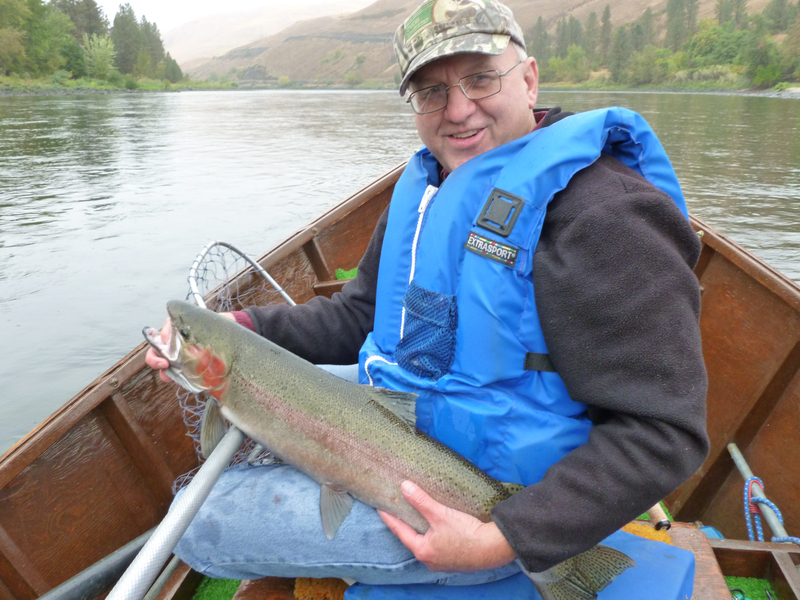 In the Clearwater Basin, there are two stocks of steelhead (A and B). The A-stock spends one year in the ocean and returns as 6-8 lb. adults. The B-stock spends 2 to 3 years in the ocean and returns as 12 to 20+ lb. adults. Adult females prepare a redd (nest) in highly oxygenated, freshwater streams. Although rare in Idaho because of distance and dams, a steelhead can spawn more than once, meaning they return yet again to the ocean before beginning another freshwater migration. Threats: The Clearwater Basin of north-central Idaho offers outstanding habitat although the building of Dworshak Dam on the N. Fork Clearwater River completely wiped out the wild, legendary B-stock. Dams, fish hatcheries, road building, logging (sediment) and over-fishing have greatly reduced wild steelhead populations since the 1970′s. The Snake River Basin steelhead (Distinct Population Segment) is currently listed as threatened under the Endangered Species Act. Miscellaneous: Land-locked steelhead or those that do not migrate out to the ocean are called redband (interior Columbia Basin) or rainbow trout (usually coastal streams).